Written by a diverse group of scholars who bring their regional expertise together, this best-selling text offers a balanced treatment of global events and developments in the twentieth century and beyond. By integrating key themes of science and technology, economics, political and social developments, international relationships, and cultural trends throughout its chronological chapters, the book uses its organization as a key tool to help students appreciate this important period in global history. Its clear prose weaves basic factual information and analysis together to create a student-friendly text, while still allowing for professors' personal interpretations. 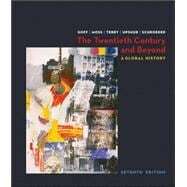 This seventh edition incorporates the latest scholarship on twentieth century history, including the work of a new co-author, Michael Schroeder, and addresses key issues of twenty-first century concern, including terrorism, the environment, and more.